I appreciate very much your intent to give more relevance to information present in machines. This is the part of Connectivism that I prefer. Thanks to my studies in informatics I have very clear in my mind the difference between data and information, machines are full of data but people give them a significance, people create the context. I'm wondering, could we call knowledge this machine information because is data elaborated by people? As our facilitators said to us at the beginning of the course, I will not try to govern all the knowledge is flowing around CCK08. This night I had a little thought about what I'm reading and feeling and smelling of this course and now I'm going to try to write down it. how do you think we could manage this feeling? I do agree with the idea you express in shifting that "Knowledge has broken free from its moorings, its shackles", but it seems to me that I'm dangerously near to be carried away by the flow and .... I need an anchor! 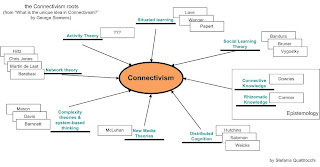 who can really participate to the connectivism? is this the future way of learning for everyone? I know, I'm not a very clever student. I am in late with my homework but today I produced this map and I discovered how much ignorant I am! This is my first post of my very first blog. I confess I'm a bit nervous, writing my thoughts in a public place is an important step to get involved in social networking and e-learning 2.0. But now I have a concrete reason for opening a blog, the CCK08! Yes, I decided to be part of an incredible web event, it's a MOOC, a Massive Open Online Course organized by George Siemens and Steven Downes.